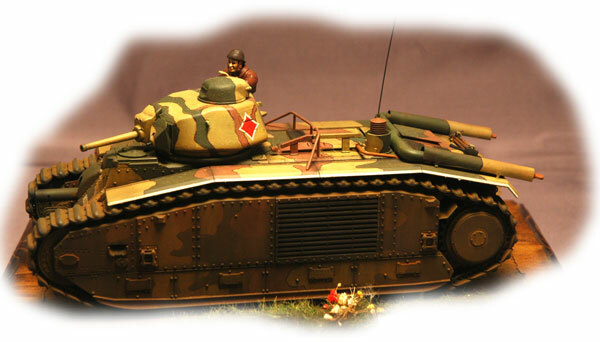 The French Chars B1 bis tank was the most heavily armed and armored tank in the 1940 Battle of France. Development started in the mid 1920’s but the final design was not finalized until ten years later. The first model, the Chars B1, featured a short barreled 47mm gun in the APX-1 turret. There was also a 75mm cannon in the hull that was aimed by steering the tank. In addition there were provisions for pulling a fuel trailer to help with the tanks very short range. The Chars B1 bis featured an upgraded APX-4 turret with a longer 47mm gun along with the 75mm cannon and had a revised engine deck and deletion of the trailer fittings. It also had a more powerful engine and increased armor. Unfortunately the Chars B1 design was outdated by the time World War Two broke out. 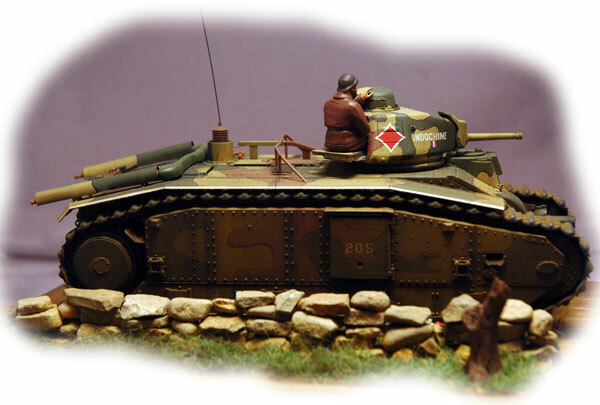 While the 47mm gun was probably the best anti-tank gun then in widespread use, the turret was small and was manned by only one crew member, the tank commander. He had to direct the tank, locate a target, and load and fire the gun. The short range was further handicapped by the lack of training by the French because many units did not get their tanks till very later and had little time to work out refueling practices. On the plus side the Chars B1 was basically immuned to most German anti-tank weapons, though the 88 and 105 mm guns in anti-aircraft and artillery units could penetrate its armor. Its one weak point was the large engine grate on the left side of the hull. The hull mounted 75mm gun was designed for infantry support but was capable of some armor penetration. Its main weakness was how it was aimed, only being able to be elevated or depressed. Sideways movement required the tank to pivot. During the Battle of France the Germans developed a great fear of the Chars B1 since it was basically immuned to most of their anti-tank guns. When met head on the Chars B1 more then held its own, but superior German tank control, tactics, and tank crew layout tipped the scales against it. More Chars B1’s were destroyed by their own crews due to running out of fuel or minor damage then were actually lost in combat (139 versus 128). After France capitulated the Germans acquired 161 tanks and used them in Russia, the Balkans, the Channel Islands, and France. Some were modified as flamethrowers and will be the subject of another Chars B1 build in a future installment. The Chars B1 is one of my all time favorite tanks. I build the old resin MB Models Chars B1 and have another one and the resin ALBY kit in my stash. But when I heard that Tamiya was planning Chars B1 bis I couldn’t wait. When Squadron listed it on their web site in the spring of 2006 I ordered two of them the next day. 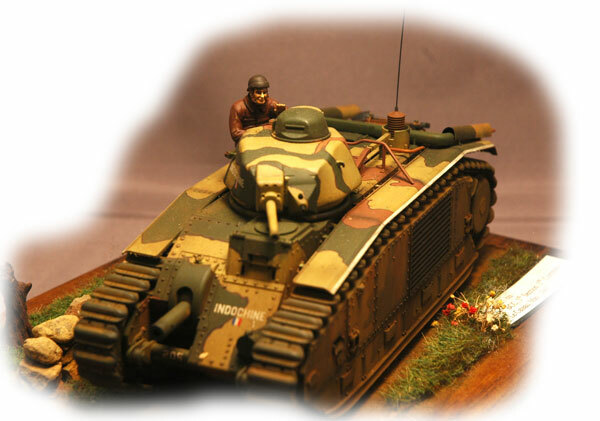 Tamiya would issue it again in 2007 in a German version with minor modifications. Blast Models then issued a resin conversion kit of the flamethrower version. ADV/Azimut followed with a resin conversion to backdate it to the early one. Not to be outdone Friulmodels issued a track replacement set. In addition there have been a number of updates and photo etched sheets since the initial release by Tamiya. At the 2008 IPMS Nationals at Virginia Beach Hobby Link Japan was having a sale the last day of the convention and I picked up seven of the Tamiya kits for around half price-I told you I liked the Chars B1! To my mind this kit is one of the best kits Tamiya has ever done. It literally falls together, and you can build it out-of-the box without any of the mentioned after market products, and produce an outstanding model. The first step is the hardest, making the two sets of road wheels for underneath the sponsons. Hard in the sense that there are 64 individual road wheels. I suggest painting them the base color while on the tree before you remove them so no bare plastic shows thru during later painting. The drive sprockets are next. The right drive sprocket is part of the hull assembly that includes the 75mm cannon while the left one is just on a plate. Again, I suggest painting them the base color as they will be hard to completely paint after assembly. I did substitute a metal barrel for the kit one but that was my choice and the kit barrel is just fine once the seam is filled in. There are several other minor parts added to the lower hull section but nothing complicated. The one piece upper and side hull is beautifully molded. Some internal fittings for the mud chutes ( B20 and rear wall ( B3, D5) need to be installed before the exterior is dealt with. On the top of each sponson are several track guides (A28-A33). Be sure to get the right ones in the correct positions. The sponsons tops lack small mud scrapers and bolts which should be added. 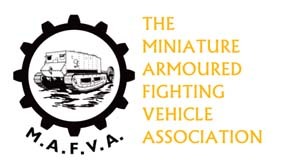 Military Miniatures in Review (MMIR), Number 44, has an extensive article on updating and correcting the kit which I highly suggest. It wasn’t out when I built this kit but I used it on my German flamethrower version later on. The rest of the hull assembly is straight forward. The large engine grate on the left side fits like a glove. The front hull plate also fits very well though I used a little filler on part B15 and B16. A small lift hook is missing from the top of the 75mm gun shield. Called a “pig-tail” due to its shape, it needs to be added from either stretched sprue or wire.The instructions have you next assemble the tracks but I waited to add them until after the final painting. The tracks are individual link and snap together. It takes about 15 minutes to do both sides and they are moveable. They are great to work with and fit without a problem. There are some mold marks on their interior that I removed but that is probably not a necessary requirement because of how they lay. While the Friulmodel tracks are very nice and have thinner edges they are expensive and I think the Tamiya ones look just fine. Depending on the version you do you have a choice of two types of fenders and two styles of exhausts and covers. I used photo etched muffler covers for scale thickness though you can thin the kit ones down. I also detailed the antenna housing with Evergreen Plastic though there is photo etched detail available too. A small cable and conductor need to be added to it which runs from part B21 into the hull. A small piece of thin wire that is removable was fitted to the antenna mount The tool holders were thinned down and detailed with straps and buckles. I substituted pre-blackened chain for the Tamiya chain and added a Branchline tow hook from their railroad accessories. That basically finished up the hull. The turret is a very simple build. I substituted a metal barrel but the kit one is fine once the barrel seam is removed. The turret is very smooth and I added texture with Floquil Prime and a stiff brush. I also added the weld seam with thickened primer for a very subtle effect. You have the option of the rear hatch being opened or closed. 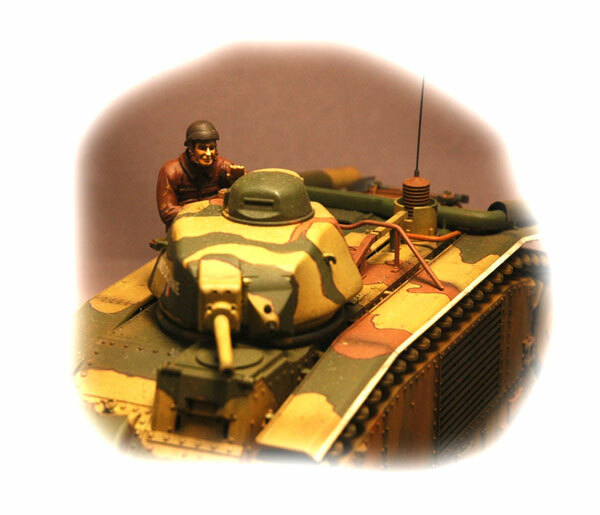 The Tamiya kit comes with a nice tank commander so I opted for the hatch being opened. I normally spray the inside of any tank turret flat black since little if any detail is shown. The Chars B1 came in eight distinct camouflage patterns depending on which factory produced the tank. The Taimya color sheet includes three of these multi-tone patterns. The other ones is a plain overall gray scheme and variations of these three. I sprayed a base coat of Floquil Panzer Yellow as the scheme I was depicted was of a Renault build vehicle. Once it dried I marked out the pattern with “Silly Putty” and sprayed a Floquil German Red Brown. These colors are all from their defunct Military Paint series. After more masking I added the final color, Pactra Forest Green. After it dried I pulled off the “Silly Putty” and touched up any imperfections. This tank had a white border on the fender and this was taped off and sprayed. Then several layers of Testors Gloss Coat went down to provide a smooth surface for the decals. I used the kit decals and was pleasantly surprised by how well the Tamiya decals went down. A little bit of setting solution and then several coats of Testors Dullcote and the decals looked like they were hand painted. I used a combination of light washes, dry brushing, a water based paint and dirt mix for the lower hull, and pastels for the sides of the tank. The Chars B1 was a notoriously dirty vehicle and the sides were streaked with mud and dust. I added a light dust spray to accentuate this and black paint and pastels for the engine grate. The tracks were painted dull black and then rubbed with pencil lead. Then they were placed on the tank before adding dirt and weathering them. I was pleased with the overall effect of the model and mounted it on a small base with a rock fence, Heki grass, and some flowers to depict the spring of 1940. At the 2008 IPMS Nationals at Virginia Beach it won a 1st and was nominated for “Best Armor” but lost out to Master Modeler Ben Gunther. I was just happy it placed and was even considered for the “Best” award. Since then it has also placed at TORCAN, AMPS, Sharpsville, and Kalamazoo. 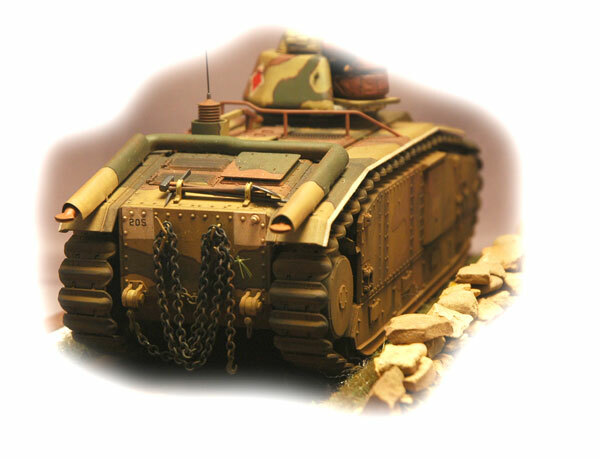 The Tamiya Chars B1 bis is an outstanding kit with no vices. It is one of their best releases to date. I highly recommend this kit to anyone with an interest in this time frame. The range of markings is wide and it saw service in numerous theaters during World War Two. I have already built two and have started on a third one. At the Phoenix IPMS Nationals there was a huge collection of these and it was very impressive. And there is a lot of reference, after market details, and conversion kits out there for it. What more can you ask for in a kit?